Do you know someone who is suffering with neck pain, always using modern technology, on their smartphone or tablet? Do they complain of neck pain or have you noticed their posture changing whilst using these devices? Could they be suffering with text neck? Do you think you know of someone who maybe suffering with Text neck? Interesting article from the WebMD website. Spinal manipulation and chiropractic care is considered a safe, effective treatment for acute low back pain. In addition, osteoarthritis and fibromyalgia may respond to the moderate pressure used by chiropractors. Teenagers suffer neck and back pain because they spend too long hunched over iPads and phones. At the reading Chiropractor, we try and offer postural and ergonomic advice to help try and avoid problems. Correct posture is important for children as well as in adults. Due to the use of handheld devices: tablets, mobile phones and gaming devices, more and more teenagers are suffering with posture related neck and low back pains. It’s unlikely computer addicted teenagers will take any notice – although desperate parents might be grateful for this ammunition. Four in ten teens have suffered back or neck pain from spending too much time slouched in front of the TV or a computer screen, according to researchers. A study by the British Chiropractic Association revealed that more than one in seven parents said their son or daughter’s problem was a result of using a laptop, tablet or computer. The survey of more than 460 parents of 11- to 16-year-olds also found that 23 per cent of teens are spending between two and four hours a day watching TV, while a quarter spend the same amount of time on a laptop, tablet or computer. Based on a two hour period, young people spend more time on games consoles (33 per cent) than doing an activity such as riding a bicycle (12 per cent). Nearly half of the parents polled (46 per cent) acknowledged that their children don’t spend enough time exercising, despite NHS guidelines stating that children and young people between five and 18-years-old need to do at least one hour of physical activity every day. Now the BCA is encouraging parents to limit the time their children spend using technology. ‘Young people are becoming increasingly sedentary which is damaging their posture. 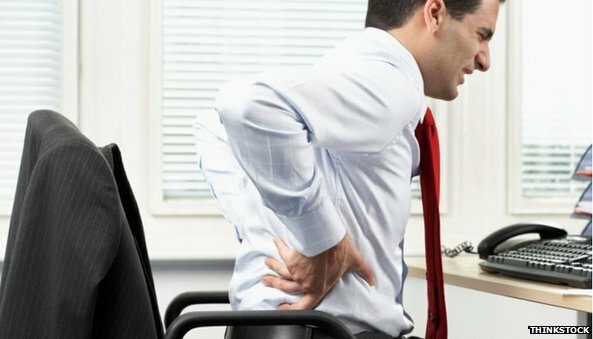 ‘There is the tendency to sit in a hunched position when working on computers and laptops, putting a lot of strain on the neck. ‘Learning how to sit properly and keeping active will help to keep young people healthy and pain free. The UK economy is slowly recovering, but the country’s workforce is in considerable pain. Almost 31 million days of work were lost last year due to back, neck and muscle problems, according to the Office for National Statistics (ONS).